A thought provoking article that we recommend. When it’s time for “big lunch” in Blarney Street CBS, you might expect the boys to make a mad dash outside to play chase or football. Instead, many make a move in a different way: their lunchtime sport of choice is chess. The strategic board game has been a feature at this Cork primary school for years, a tradition principal Billy Lynch brought with him from his primary school days. 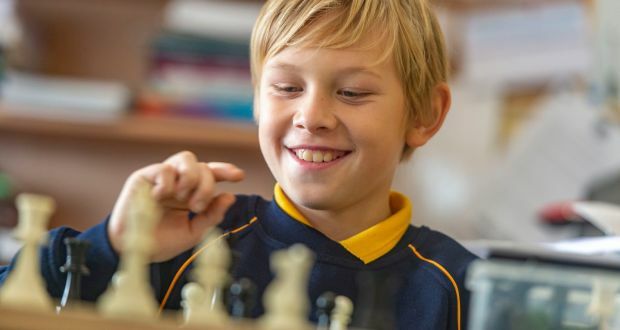 At a time when screens are blamed for shortening children’s attention spans, Lynch finds chess is luring pupils away from their phone screens and helping to foster crucial skills we once took for granted. “It’s quite social, during lunch they chat away while they are playing,” says Lynch. But it is the impact of the strategic game on students’ concentration that really stands out. Up and down the country, other schools are embracing chess too and seeing the benefits among schoolchildren. April Cronin, a retired primary school principal and former Irish chess champion, runs chess workshops for teachers in Dublin. She has noticed social awkwardness becoming more prevalent in her chess clubs of late. It prompted her to teach basic social interactions during her chess lessons. “The first thing I taught them was how to actually shake somebody’s hand and look them in the eye. It was extraordinary how many children didn’t know how to do that,” she says. Click above to read the full article. Hampshire Junior Chess Association is the principal coordinator and organiser of chess for children and young people who are eighteen years old or under and live or attend school in Hampshire. Merry Christmas from HJCA ! John Upham on Calling all Hampshire Juniors ! Michael Blake on Calling all Hampshire Juniors !